Every year, soon-to-be-dads wait out the birthing event. Their job is to stay away and to keep a lookout not far from the den area to ensure that everything remains safe for the birthing mother and pups. Birthing, of course, is a vulnerable time for all of us, and the male, in this manner, puts extra effort into his mate’s and offspring’s protection and security, and goes the extra mile for their needs, including bringing home food. For me, this activity has always served as a sort of secret “birth announcement”! Of particular interest is the fellow above on the rock. For years now, when the time comes, he hangs out on the same rock regularly for up to a couple of hours a day for several days as his mate gives birth. Because of this, I call it “the birthing rock”. Several days ago, I decided, “it’s time”: I had seen these two mate a couple of months earlier. I began visiting the rock daily. 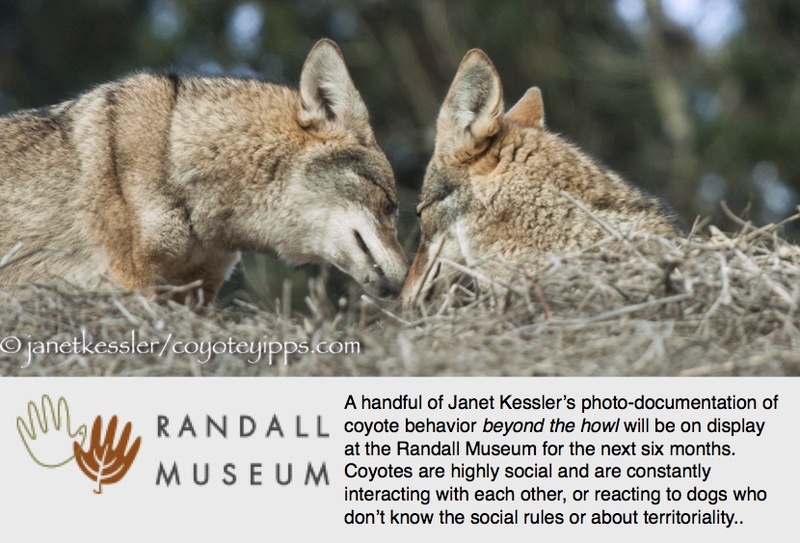 When you can predict coyote behavior, there’s a feeling that maybe you’ve “arrived”: that you know coyotes as well as it is possible to know them. For several years now, I’ve been able to predict a bunch of behaviors, which always impresses those I’m talking to as much as it impresses me myself! :)) I’ll state what is about to happen, and then it happens! So I knew this guy would imminently be on the birthing rock, and within a few days of looking for him, there he was! So pups are either being born or have already been born here in San Francisco. Another tell-tale sign will be lactating mothers, if you can find one: behaviorally, most coyote mothers I know generally keep themselves more secluded and hidden when their pups are very young: maybe this is a security precaution — keeping themselves out of danger’s way — to make sure they are around to nurture and take care of their growing and dependent pups. In many coyote moms, their condition is pretty much concealed, especially in younger moms, but in others, especially older mothers, their maternal state is more obvious, as seen below. They will be lactating through the beginning of June when regurgitated and then solid food begin taking over. Showing me her status as a mom. I really believe it’s a purposeful gesture! After brutally driving off our 3-year resident coyote and hanging around the area for about two months, the Wired intruder headed off to an area several miles away where I serendipitously encountered her a number of times. She appears to be roaming the entirety of San Francisco, from corner to corner. I wondered if she had permanently moved on. I wondered what her plans were. But she was gone less than a week and is now back patrolling the turf she battled for and won. During those two months, our previous resident coyote had been staying away and hanging low as she recovered from her severe wounds and infections. Then, during the last week she, of course, became acutely aware of her rival’s absence and was making daily forays to her old turf, bravely sticking her toe in the door — so to speak — moving to reclaim her domain. We of course no longer ever saw her romping joyously at the top of hilltops, Queen of her domain and ever so happy, but rather slithering by quickly and surreptitiously through inconspicuous places. Her tentative forays were not being met with resistance from her arch-rival and things appeared to be going well for her. That was during the week the Wired coyote was away. But now that she’s back, we’ll have to wait and see what kind of a truce, if any, is worked out between them. Let’s hope there’s not another fight. It’s been an amazing drama, and a scary one, if you care. One has to wonder at the stress and tension being sustained by this brave little creature willing to risk her life to defend her turf. Coyotes are known to kill each other over their territories: it goes to show just how important their exclusive land-claims are for their survival. Again, I want to point out how intense coyote lives are, with ups and downs to match anything going on in the human world.